This turret has been slightly modified from the turret included with several of Dragon's 75mm-armed Shermans. It is almost identical to the kit turrets, but with some added foundry casting marks, and a couple of tie-downs added to the rear of the bustle. You have a choice of two different guns, both with the M34 rotor shield, one with the side armor protection, the other without. 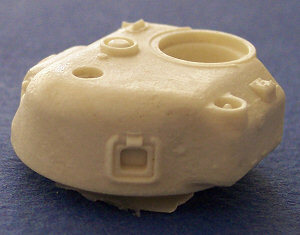 An armored cover for the coaxial MG is also included. 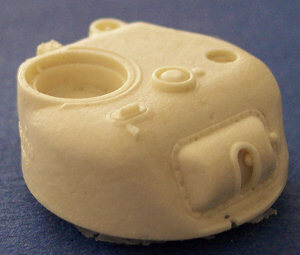 The quality of the resin casting is first-rate. There are no flaws or blemishes in this sample. Although there will be a significant seam to sand from the bottom of the barrels, this is far preferable to having to fix a nasty warp, which is avoided by casting the guns in this manner.